We often tend to put so much effort into adjusting our glazes to fine-tune fired properties that we tolerate poor application properties. Such glazes are not only frustrating to use, but they often produce poor fired results. When a slurry is right it should 'gel' and 'hang on'. You should be able to dip your finger in and pull it out with an even coverage and no drips. In fact, a thixotropic glaze will resist shedding off ware covered with wax emulsion! And it will not settle out hard in the container! Yes, there is no reason to put up with a glaze that drips and drips, cracks on drying, dusts and does not produce an even layer (yes, these problems are all related). In industry, maintaining the 'rheology' (flow properties) of the glaze slurry through material, water quality, seasonal, and personnel changes is often the most difficult challenge a factory faces. Maintenance of the specific gravity in particular is a reference point, 'an anchor' around which all other adjustments hinge (if your glaze is working well, measure its specific gravity now). If your glazes application or drying properties are often problematic or they are always difficult to work with, read on, recipe change(s) might be most appropriate. Be careful about using glaze additives, try all the other approaches first. The glaze slurry must be thixotropic, it must "gel" so that the mechanism of its initial adherence to the ware is, to a considerable extent, a function of this property rather than absorption of water by porous bisque. While thixotropic behavior can be achieved by using glaze additives, most people lack the experience, knowledge, equipment and circumstances to use them properly. It is thus desirable to avoid additives if possible and try to select a kaolin or ball clay that contributes thixotropic properties. EPK (kaolin) is a good example. If your glaze does not contain adequate kaolin (15-20%) then use ceramic calculations (e.g. Digitalfire INSIGHT) to adjust it so that it does. How is this possible? Because ceramic chemistry sees materials as 'oxide contributors' and it is thus possible to supply a specific chemistry from different mixtures of materials. It is possible to have 20% kaolin in cone 04 glazes if you use low alumina boron frits. At higher temperatures glazes have significantly more Al2O3 and SiO2 and so it is usually easy to achieve a 25% kaolin content (because it contributes Al2O3 and SiO2). However there are many high temperature glazes that have large percentages of feldspar, sometimes 70%! In such the feldspar is supplying all of the needed Al2O3 and so there is little room for clay in the recipe. These glazes are evil and there is no need for this. The simplest way to fix this problem is use ceramic calculations to reduce the feldspar and supply the alkali oxides from other sources. This will enable you to increase the kaolin to supply the lost Al2O3 (from the feldspar reduction). Ferro Frit 3110 is a good example of a frit that is very similar to a feldspar in chemistry, but it has very low alumina. Different clays produce slurries of differing properties. Bentonite-like materials have the ability to gel in water in small amounts, they will help suspend the other particles better than any other material. However bentonites gel the water and hold onto it so well that using any more than 5% will cause glazes dry too slowly and shrink too much. Ball clay is better, 20% of it in a recipe can produce a nice slurry, and many people prefer its characteristics. 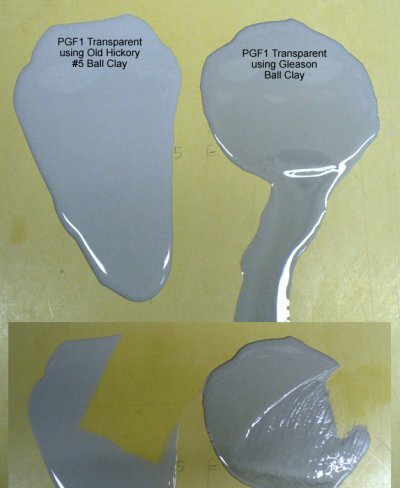 However ball clay glazes do not necessarily gel well (and ball clay introduces more iron than you might want). If you have a kaolin that suspends well, it is the ideal material. In North American, EPK, for example, produces very nice slurries that suspend well and gel to help them hold on immediately after the dip. Experiment with the kaolins and ball clays available to you to find the best one. Some materials are soluble or partially soluble, this is even the case with some frits (which are of course not intended for glazes). When materials dissolve in the glaze they introduce electrolytes into the water which in turn can affect the viscosity of the glaze. For example, high nepheline syenite glazes can thicken over time and each time you add water to re thin the glaze shrinks and cracks more during drying on the ware. High boron materials are often soluble. Clays, especially raw and native clays, often contain soluble sulfates that can dramatically affect the slurry. These problems can be insidious because these materials often dissolve slowly overtime and thus the rheology will change accordingly. Admittedly, companies with a continuous production line can use slightly soluble materials since their glaze is used quickly and is not stored. Bisque ware should not be too high in porosity. Variable porosity means variable thicknesses in the overlying glaze. Porous bisque ware demands that glaze slurries be thin and runny or the application will be too thick. If you are used to bisque firing from cone 010 to 06, go to 04 or higher if you can and use a more gelled glaze. Misuse of glaze additives is very common because they are not nearly as well understood as other materials. Often they are listed in recipes in which they are not really needed. They should be avoided if possible, because they often have detrimental side effects. Remember, although you might think your glaze needs them, does it really? Only all-fritted glazes with very low kaolin normally need additives in typical traditional ceramic applications (an exception is crystalline glazes that require a low alumina content). Many people use additives that actually worsen the application properties of their glazes. In these cases, often a recipe adjustment to increase clay content (by sourcing the same chemistry from a different set of materials) or a simple bentonite addition would be much better (i.e. gum additions may give a thinner applying, slower drying, 'drippy' glaze). Again, do not use an additive if it is not needed, additives are not a substitute for a good glaze recipe. Individual additives often defy easy classification because they claim to impart suspending, adhesive and flow properties. Thus picking the right one is a matter of discerning the need and using the additive that 'emphasizes' the needed slurry property and gives the fewest side effects (i.e. color change, slow drying rate, biodegradation, film formation). I might add that it is also common to use much more of an additive than is needed, normally completely ruining glaze slurry properties. While gum does form a gel to suspend particles, it is usually more useful in making the slurry 'sticky', and acts as a temporary glue to cement otherwise loosely adhered particles; thus it is referred to as a 'binder', 'hardener', 'adhesive'. Remember that the mechanism of glaze adherence is normally simply contact, it 'hangs on' to irregularities in the surface by virtue of its own strength. Thus a harder dry glaze layer will adhere better. Note also that clays can impart both dry hardness plus suspension and gelling properties to the slurry, whereas gums usually only harden it. Starches usually act as hardeners and may thicken the slurry (therefore suspending it better). Cellulose ethers are used like gum and starch to harden and thicken, they are said to be more consistent and easier to control. Claylike plasticizers (like Veegum) can impart similar claylike properties to a slurry, but remember that the beneficial properties of kaolin, for example, come largely from having alot of it in the recipe. Bentonite clay, likewise, can be beneficial but only in amounts small enough that prevent it from slowing down the drying significantly. So generally clay-like additives have these same limitations. Other additives include wetting agents, foam control agents and sealers. People who know how to use these materials can do things with glaze that others might think impossible. Likewise, those of us who do not know how to use them can create a real mess. Manufacturers usually have instructions so do not buy these materials without good instructions. Electrolytes change the pH of the suspension and affect the charge of particles (this changing slurry viscosity); a few drops can make a thick slurry very runny and thin (deflocculating it), or make a thin one gel (flocculating it). Thus deflocculants/deflocculants can be used to adjust otherwise variable flow properties. But this cannot be done by a novice. The amounts required are generally extremely small and must be tuned to the specific batch by careful measurements (a few drops too much can literally turn your glaze into jelly or make it settle like a rock). It is amazing how much a small amount of a flocculant, such as calcium chloride, epsom salts, or vinegar can gel a glaze (so it makes sense to test on a small amount before adding it to a whole batch). At the risk of being repetitive, please consider: if you need to use these materials is it possible that adjusting the recipe to increase the clay or remove soluble materials (e.g. boric acid, nepheline syenite, lithium carbonate) would be a better approach. One real downside of these materials is they can put a glaze batch on a roller coaster viscosity ride, even with powerful mixing equipment to try stabilize their action. Do you really want that? If you are storing your glaze slurries it is very beneficial to have a mixer that can put alot of energy into the slurry to thoroughly wet the surfaces of all particles during primary mixing. After this, final adjustments with water content and possible additives can be done to establish the final rheological properties. When this is done the glaze slurry will be more stable for a longer period of time. My general advice is this: If your glaze is not suspending, hardening, gelling or applying properly, then, if possible reformulate it to have more clay, especially kaolin. If it still needs help then add bentonite (up to 3%). If the glaze still needs extra help, then use an additive, but beware. If there are still problems, then, heaven forbid, use a flocculant or deflocculant or study up on other more exotic additives! The ball clay you use to suspend your glaze is important! I poured 4 teaspoons of two glazes onto a board and let them sit for a minute, then inclined the board. The one with Gleason Ball clay (right, much higher in coal and finer particle size) has settled and the water on the top of running off. The one with Old Hickory #5 ball clay has not settled at all and the whole thing is running downward. Below I have begun to sponge them off. Old Hickory No. 1 Glaze Clay is even better than #5 for suspension. The most amazing thing about this: There is only 7% ball clay in the recipe. It is possible to have a glaze slurry that is a joy to use, but only if you understand the physics of the materials in the glaze recipe.